Presenting a man who needs no introduction. 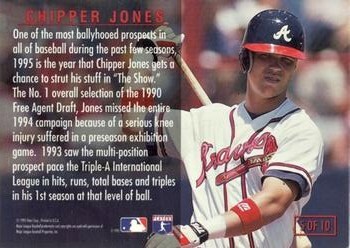 Great job, Chipper, and congrats on another playoff run! 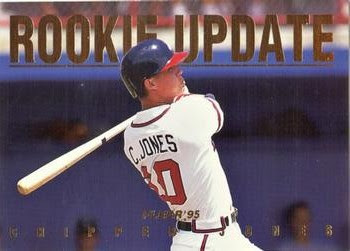 That's a great baseball card swing and glad Fleer went with the horizontal format. "Ballyhooed" on a baseball card! "The Show" is both capitalized and quoted! That kind of stuff makes my day. Good luck to all the playoff aspirants. Here's how I imagined my Mariners planned for the off-season. BIG SHOT #1: So, the team still can't hit. What do we do? BIG SHOT #2: Move in the fences for 2013? BIG SHOT #1: Great, let's do it. 8am tee time tomorrow? BIG SHOT #2: Works for me.